The length varies from 10 to 13 in. / 25 to 33 cent. with a triangular shaped head. The snout of the henkeli is 120 -160 mm / 4.8 - 5-6 in. 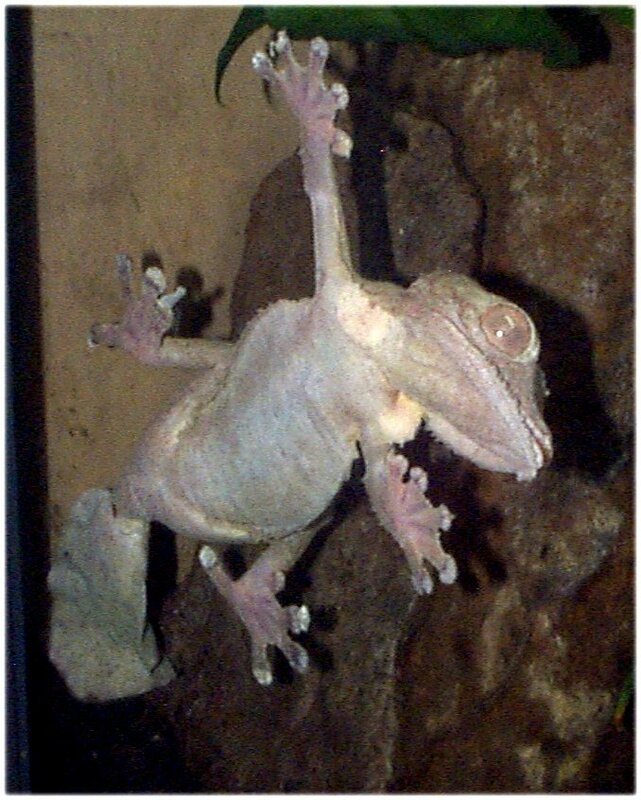 The geckos tail, feet, and hands consists of specialized plates each bearing numerous microscopic hook like cells that allow them to cling to smooth surfaces, and glass. The tail on the gecko is in the shape of a leaf. Henkel's are olive green or a brown with dark spots, blotches, or flecks. 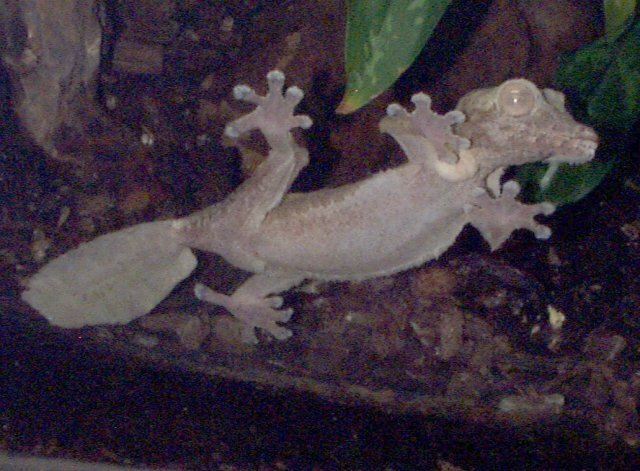 The anterior side of the gecko is usually a whitish color. The males and females can be identified by the different coloration: males are yellowish brown and the females are grayish. The eyes of both sexes are beige or pinkish brown with red spots, which gives the overall appearance of the eye color to be a brick red color. 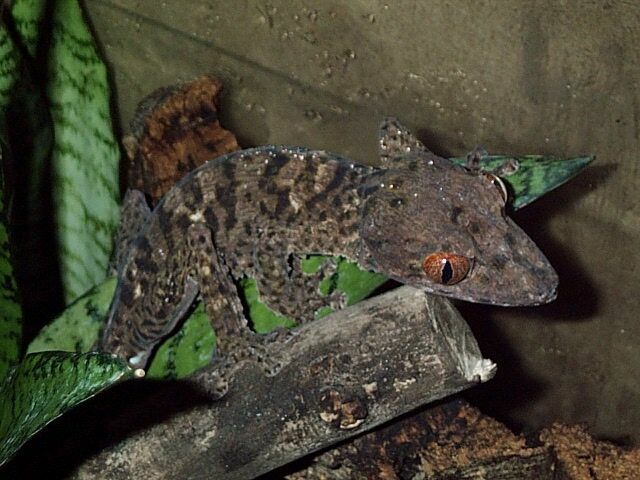 The Henkel's Leaf-tailed Gecko is one of the most unique Geckos in the entire genus. The geneus contains 9 species: U. henkeli, U. malahelo, U. lineatus, U. sikorae, U. fimbriatus, U. alluaudi, U. guentheri, U. ebenaui, U. phantasticus. The species of Uroplatus are not endangered, but due to the cutting down of the rain forest many of the species are found in undisturbed parts of Madagascar. Herpetoculturists are setting up colonies to maintain the species of Uroplatus.U. henkeli is one of the species that are most frequently kept by breeders; also U. henkeli is frequently imported from Madagascar.This method of importing the Uroplatus is very unhealthy and causes stress to the reptile. 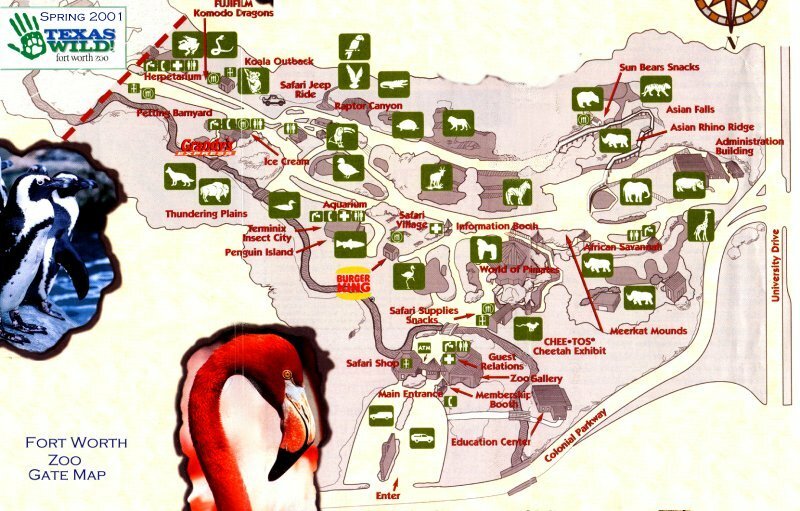 CITES is not currently protecting the genus, but at the current rate of deforestation the genus will soon be threatened. U. henkeli will hide under plants or rocks for protection from its predators. This gives the gecko a camouflage effect making it hard for the predators to detect it. Also, when the U. henkeli is attacked, it lets out a screeching distress call that startles the predator, which sometimes results in the gecko's escape. U. henkeli has no eyelids, and a vertically oriented pupil. The pupils have 4 small pinhole openings that shut out the light during the day. At night the pupils dilate to permit the passage of available light (moonlight) thus allowing the gecko to see while it searches for food.The gecko licks its eye to clean it from dust or other particles. U. henkeli's tail can drop off when it is frightened, and it can regenerate a new tail. When the new tail is regenerated the appearance of the tail is different: longer, shorter, or inflated. The geckos like to hide in things such as hollow trees, cork bark, and behind plants. The female gecko has two eggs that are buried in the floor, and it takes about 90 days to hatch. The gecko is a nocturnal reptile that can distinguish between light and dark. Since the gecko is a nocturnal animal, the gecko is fed primarily during the evening hours. The snout of the gecko is very fragile, so the animal is fed with tongs or a small cup with a thin sponge layer inside for protection. During the day the gecko spends most of their time sleeping on branches and cork bark. The larger sized gecko can survive in chamber no smaller than 2 x 4 x 3 ft/ 60 x 120 x 90 cm. On the other hand the smaller gecko can survive in a chamber that is 2 x 3 x 2 ft / 60 x 90 x 60 cm. The environment should include cork bark chips, peat moss, leaves, branches, and UVB lighting. 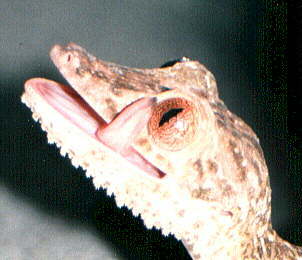 Author not available, Leaf-tailed Gecko, Encyclopedia of Australia, 01-01-1999.